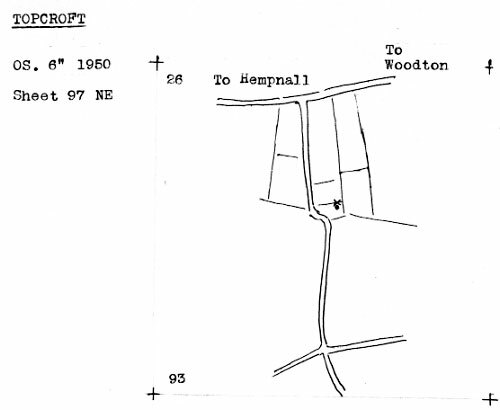 Topcroft postmill stood to the north of the village to the east of Oxnead Lane. 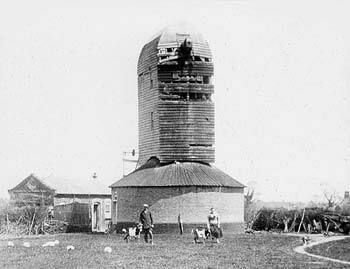 The mill buck was set on a two storey roundhouse. Four double shuttered sails powered 2 pairs of French burr stones and a flour mill. The mill was turned to wind by a 6 bladed fantail on a ladder. Post:- 25 ins. square at base, 14 ins. square at top. Instead of the usual collar where the post passes through the lowest floor of the buck, there was a circular frame which carried two rollers; one bore against an iron ring on the post and the other on a horizontal track built up off the quarterbars. Vertical iron track was fixed round the post below the sheers and iron rollers on brackets bolted to the bottom of the first floor took the place of the steady bearing. No collar was fitted but a small horizontal track fixed to the quarterbars was provided for additional vertical rollers. Brakewheel:- Wood, clasp arm, with flanges on iron wind shaft instead of squared section. Post 25 ins. square at horns tapering to 22 ins. at collar, 14 sided above collar. WANTED, a Single Man, one that has been used to a Windmill preferred. A good character and reference from his last employer required. 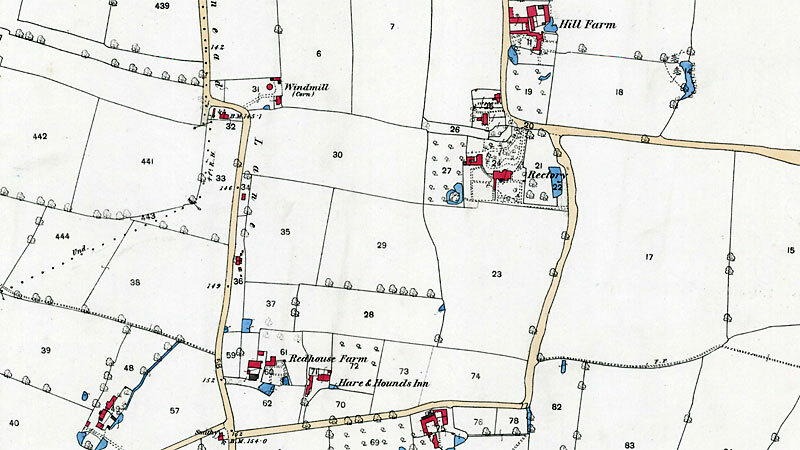 Apply to E. Eldred, Topcroft Mill, near Bungay. 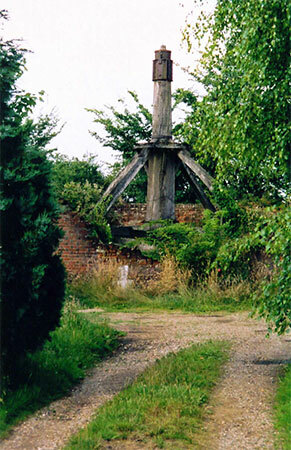 To be Let immediately, a POST WINDMILL with Patent Sails and self-winding Gear. Two Floors in Round house and driving two Pairs of French Stones and Flour Machine, with House and Stable and one acre of Land. Apply to John Rounce, Topcroft, near Bungay. Wanted, a steady Single Man to Work a WINDMILL. 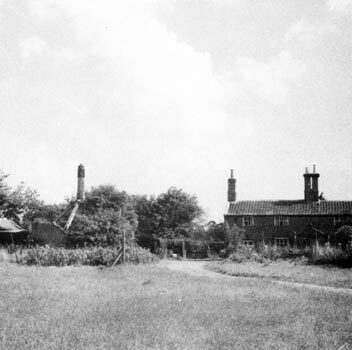 Apply to G. Potter, Topcroft, Bungay, Suffolk. 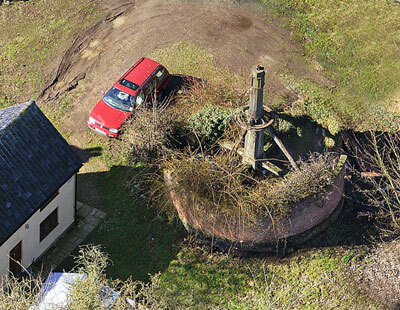 Apply to Geo Potter, Topcroft, Bungay, Suffolk. William Lant Duffield owned the mill from 1909-1916, he also owned Saxlingham_Thorpe_black_towermill and the watermills at Flordon, Saxlingham Thorpe and Tasburgh. Sarah Ann Doughty, wife of Thomas Doughty of Topcroft, miller, applied for a separation order against her husband. ... public examinations before Mr. Registrar Cooke at the Norwich Bankruptcy Court on Tuesday (14th) The examinations were conducted by the Official Receiver, Mr. H. P. Gould. William Lant Duffield, miller and farmer of Tasburgh_Mill and Saxlingham_Thorpe. Gross Liabilities £1697. 4s. 2d: deficiency £632. 2s. 2d. ... His insolvency was due to want of capital and losses occasioned by the flood of 1912. 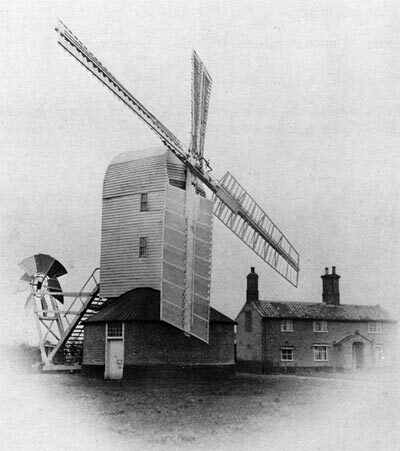 Halesworth - Calver's Mill demolished in 1942. 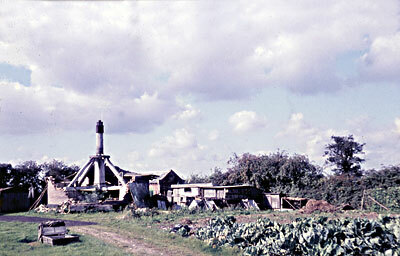 Various parts of the mill went to other mills including the windshaft, which went to East_Harling_towermill in 1975. How fascinating to read your history of Topcroft mill. I've just found out that my mother was born there in 1919, as it seemed to be the family home, although the mill was not worked at the time. My mother is now aged 94. In the 1980s she was Lord Mayor of Norwich. She was born Barbara Ellen Edith Yallop, now Stevenson.